Fiery Jeff Garcia became a fan favorite. INDIANAPOLIS - That No. 7 Jeff Garcia jersey in your closet just became a memento. Six weeks ago, when the Eagles' season ended with a playoff loss in New Orleans, this outcome was hard to envision. Garcia said he wanted to return to the Birds and they said they wanted him back; the only hangup seemed to be the possibility that a contending team would want to bring in Garcia as a starter. Since then, though, the Eagles' front office and the Garcia camp have been locked in an awkward, wary dance that ended abruptly yesterday, the day after Garcia's 37th birthday, when the team signed quarterback A.J. Feeley to a 3-year contract extension, through 2010, and let it be known that Feeley will back up Donovan McNabb this season. If other teams' indications so far can be taken at face value, Garcia is unlikely to land that starting job with a contender; he instead will sign somewhere - Denver? Tampa Bay? - as a backup, or go back into the situation he said he didn't want to face again, starting for a struggling team, such as Houston. Team sources confirmed there is no chance of Garcia returning to the Eagles, and they also confirmed that the team is very unlikely to make an offer to pending free-agent wide receiver Donté Stallworth. How did the fans' favorite Eagle, who helped turn the team around to the tune of a 6-2 record after stepping in for McNabb, become just a memory so quickly? Eagles officials don't want to be quoted as saying anything that could fan the flames of public indignation, but they said they wanted to either re-sign Garcia or extend Feeley before free agency started, and they never felt confident Garcia was ready to do a deal, even though Baker said yesterday that he was willing. Baker might have overplayed his hand initially, telling the Birds he wanted 5 days of free agency to assess the market before signing with them. Although Baker said he subsequently let it be known he and Garcia would be open to an offer before free agency, the Eagles said they couldn't be sure Baker and Garcia wouldn't just use their offer as a springboard to up the bidding when free agency starts Friday. And if Garcia really was so intent on returning, couldn't Baker have called the Eagles' bluff and made them an offer? On the other side of the tango, everybody knows how it is with the Eagles and negotiations. They like to be in the driver's seat. They set conditions - such as the bit about needing to get a deal done before free agency or not doing one at all - designed to turn up the heat on the other party. It's legitimate to wonder, if the Birds really wanted Garcia back, why they never made him an offer, and why they absolutely had to have a deal with either Garcia or Feeley this week. Feeley was under contract for the coming season. "The Eagles make it a challenge," Baker said yesterday, as he prepared to leave the annual NFL scouting combine having not accomplished what he said was his main reason for coming - to sit down and talk contract with the Birds. "I respect that they make it a challenge. They are one of the most successful teams in the league at managing the salary cap. The fact of the matter is that their model works, and I respect that their model works. While I believe Jeff should have been given an offer by the Eagles, and I've expressed that for the last month . . . they've been too successful that you can question their ability to do deals." Baker acknowledged yesterday that "Jeff was uncomfortable with being given an ultimatum after he said he was prepared to come back as a backup," and Baker said that discomfort led to Garcia's statement on "The Tonight Show" that he intended to play the field in free agency. "Privately, we told them several times that we would negotiate with them before free agency," Baker said. Attempts to contact Garcia yesterday were unsuccessful. Feeley said Garcia text-messaged him congratulations on his new deal, terms of which were not announced. One knowledgeable league source said it probably was in the neighborhood of $4 million over 3 years, with about $2 million guaranteed, plus escalators relating to playing time. "Both of us understand the nature of this business and how it works . . . we're friends and we'll continue to be friends," said Feeley, a fifth-round Eagles draft pick in 2001 who stepped in for McNabb ably in the 2002 stretch drive, then was traded to Miami. He did not prosper as a starter with the Dolphins, in a different offense, then failed to catch on with the Chargers. But back in the Eagles' offense, Feeley stepped in for Garcia in the regular-season finale against the Falcons, after the Birds had clinched the NFC East title. He completed 22 of 33 passes for 321 yards and three touchdowns. The Eagles can't be certain McNabb will be completely recovered from ACL surgery when the season starts, and they really can't be certain he'll remain healthy. But obviously, they are comfortable with the idea of Feeley taking charge. "A.J. Feeley has been very productive as a quarterback in Philadelphia," Eagles general manager Tom Heckert said, in a statement released by the team. "He's won some games at crucial times for this franchise and he gives us a great amount of confidence as a backup to Donovan McNabb. A.J. 's proven to be very comfortable in this offensive scheme, and we look forward to having him in the fold for the next several years." Feeley confirmed that when he returned to the Eagles last September, after being released by the Chargers, the No. 2 role after Garcia's 1-year deal expired was "kind of part of the talks . . . one of the reasons I signed back with Philly." Feeley, who will be 30 in May, said the last few years have been "a roller-coaster ride," one that he hopes is now leveling out. "There's a lot to be said about waking up in the morning and going to work, playing for a team that you love everything about it. I was happy, I enjoy everything about playing in Philadelphia," Feeley said. Of course, so did Garcia, as he and Baker said many times. Baker has enjoyed a good relationship with the Eagles and doesn't want to harm that, since there will be other clients and other talks, but his frustration was obvious yesterday. "There's absolutely no question Jeff would have signed in Philadelphia for substantially less money than anywhere else," Baker said. "I think Jeff was their No. 1 choice to be brought back, but at their numbers. And the only person who ever knew their numbers was them . 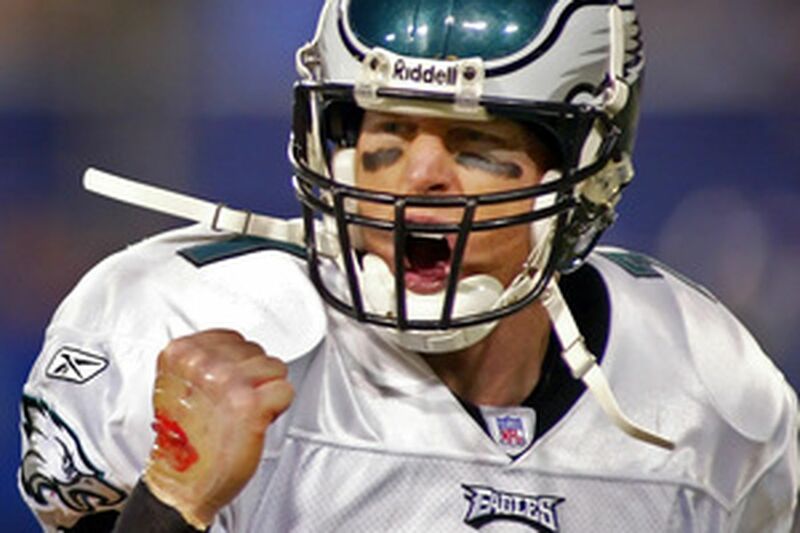 . . any deal from the Eagles, Jeff would have seriously considered." You can cross off Garcia and Stallworth - who apparently is looking to hit the free-agency jackpot - from the list of 11 potential Eagles free agents who might be brought back. Right now, the team seems interested in signing only defensive end Juqua Thomas and safety Quintin Mikell before free agency starts. Thomas' agent, Kennard McGuire, confirmed at the combine that talks are proceeding, and said he was optimistic. Mikell's agent, Jason Chayut, also sounded hopeful yesterday. "I'm still in talks with the Eagles," Chayut said. "They've certainly demonstrated interest in Quentin and he'd like to stay with the Eagles."